In this post I will try to explain a little about Seam allowance. Seam allowance (sometimes called inlays) is the area between the edge of the fabric and the stitching line on two (or more) pieces of material being stitched together. Seam allowances wary depending on where on the garment you put them. For example, in the fashion industry it’s common to use about 0,7-1 cm for curved areas (like the neck line, the armhole, the sleeve head, the crotch on pants, collars etc) and 1,5-2 cm on areas that require extra fabric for final fitting (the center back, side seams in pants etc). The last thing I want to say is about number 3 in the picture above: it’s very important, when you cut out your pattern pieces, that you fold as you will sew… see the fold-down on the pocket up there? If I would’ve continued that seam allowance line (3. ), there would’ve been some excess fabric there. 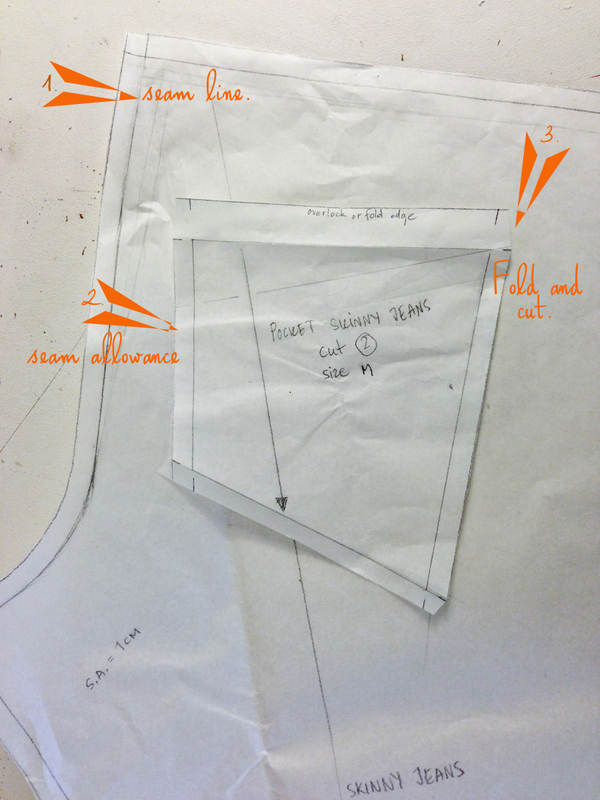 When you fold and cut, the seam allowance will follow the correct angle. Previous article What is the grain line?